Using Xerox Genuine toner and ink in your Xerox printer will ensure that prints are delivered with consistent quality. Testing conducted by independent printer evaluation laboratories proved Xerox Genuine Supplies are more reliable and deliver up to 27% higher page yields than aftermarket alternatives. For worry-free printing each and every time, count on the guaranteed quality, reliability, and performance of genuine Xerox supplies for your Xerox printer. Independent analysis shows that Xerox toner cartridges produce superior results, providing the best overall value and lowest total cost of ownership. Xerox toner cartridges are intelligent and interface with your printer or MFP to provide important status information, keeping your work processes more productive. Toner Gas Gauge: to provide visibility of remaining toner life. Average Coverage: to better understand the toner usage of your documents. Page Count: to record the number of pages printed to date to help project preventive maintenance or replacement of long-life consumables. Toner Low/Toner Empty flag alert: to notify you when a Xerox toner cartridge is near empty so a replacement can be ordered. Date of first/last use: to record when a Xerox toner cartridge was first installed and last used. E-mail option: to prompt supplies reordering and establish automated reminders. These built-in features enhance the performance and functionality of your print device. In addition, Xerox printers and multifunction printers send a warning message when non-genuine supplies are detected, protecting a printer from possible damage. Can be recycled through Xerox Green World Alliance website. Xerox is a pioneer in the development of advanced toner technologies and EA toner is a significant breakthrough. Unlike traditional toner, which is comprised of crushed and ground particles of irregular shape, EA toner is grown chemically into minute, uniform spheres of colour, utilising 25% less energy to manufacture. The uniform shape and size of EA toner particles, with their property to “aggregate” result in 45% less toner consumption when compared to conventional toners. Sharper image quality and improved fine lines and text. Higher device reliability and lower service costs with oil-less fusing. Faster printer warm-up time and lower energy consumption. Smaller, lighter toner cartridges and less waste. Xerox and Fuji Xerox have developed more than 50 office and production printing models that use EA toner. During product development, the toner composition is defined in order to maximize the entire printing process including the imaging drum and fuser components. Internal colour tables, halftone algorithms, and even the voltage charge applied to the drum are all optimized with the toner to render the highest possible quality output – the best resolution and vibrant colours for your printing applications. 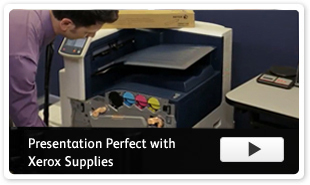 Genuine Xerox Supplies always deliver the optimum device performance and reliability. Why is genuine Xerox toner so much better? Xerox toner cartridges are engineered in an integrated design with Xerox printers. Genuine Xerox toners are safe and non-toxic. When you choose Xerox toners, you’re choosing an advanced Xerox Supplies technology, formulated specifically for each product to provide the best image quality and reliable operation..
Non-genuine toners for Xerox products are not spherical particles but crushed particles. These are more abrasive and cause early wear on drums, belts and fusers. Premature replacement of a drum and fuser will more than offset toner savings and significantly increase total cost per page. Each year, over 1 million pounds of post-consumer waste toner is returned to Xerox from selected products where it is “recycled" back into the manufacturing process and reused. As part of the manufacturing process, conventional toner that doesn’t meet the size specifications is recycled back into the Xerox toner production process.